GQ Electronics Technical Support Forum - GMC-500+ : Messed up by Temperature Sensitivity? It just so happened that I had the GMC500+ counter running for a few days, while logging with GeigerLog. Only the M4011 was installed; the 2nd tube was removed. The counter has not been touched during this time, and certainly not relocated, nor were any radioactive sources brought near the counter nor removed from it. Yet there are these strange dips in the curves, already visible in the raw data (blue), but clearly emphasized by showing the Moving Average (blue line framed with this yellow lines). If there were any radiating aliens in my study they were very selective for the tubes, because a RadMon+ counter with its SBM20 tube was positions less than a centimeter away from the M4011, and it had no sign of any dips whatsoever (brown line in next pic). This is from the very same log file; you can see the blue curve from the M4011 shining through. The dips are mostly a night-time thing, so first suspicion was light sensitivity as I had seen before. But such an effect could not be verified. You can also see the red curve in both pics. 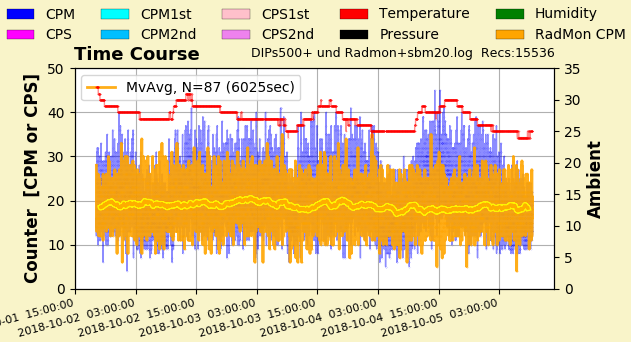 This is the temperature measured with the RadMon+ (based on a BOSCH BME280 sensor), and also in close proximity to both the SBM20 and the MN4011 tube. There is a very clear correlation of the temperature curve with the blue curve. Very odd. This looks like yet another problem with the GMC-500+. Such a performance is not acceptable. It are very clearly not data from a Poisson distribution. Will try now with a gas mantle put near the two tubes. Very interesting finding, ullix! Have you tried with your GMC-300E+? Just trying to see if the temperature sensitivity problem is in the M4011 tube or in the 500+ HV circuit. I'll try to set mine to run for a few days if I can. 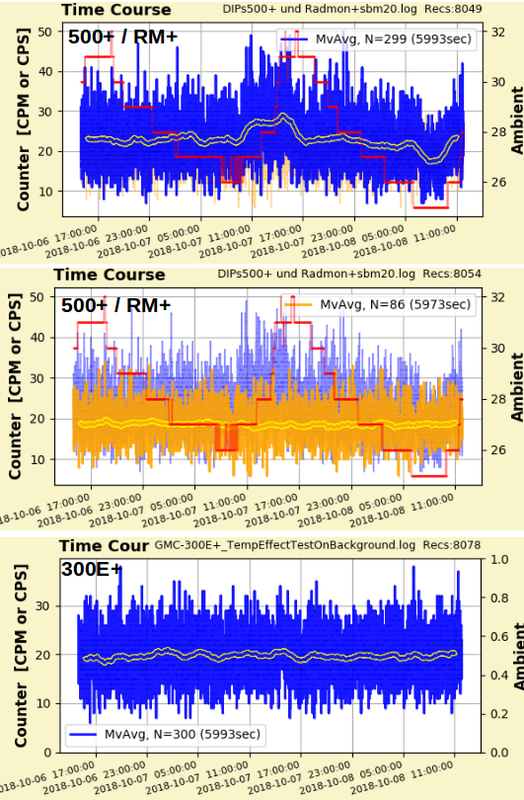 With a gas mantle put between the GMC-500+ tube M4011 and the RadMon+ tube SBM20, one sees a rock solid line with the RadMon+ (light brown line), but a steady increase with 500+ (blue line, going from 4200 to 4300 within less than a day ). The higher count rate of the SBM20 has been seen before and is not relevant here. 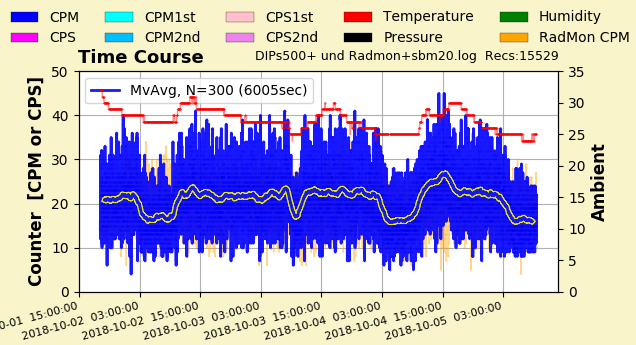 In red is the temperature, measured by the RadMon+. It is not clear if it has anything to do with the change in the 500+ count rate. Picking up on Ikerrg's suggestion of a comparison with a 300E+ counter, I went back to background and ran a second instance of GeigerLog to use the 300E+ at the same time as the 500+ and RadMon+ in the first instance. 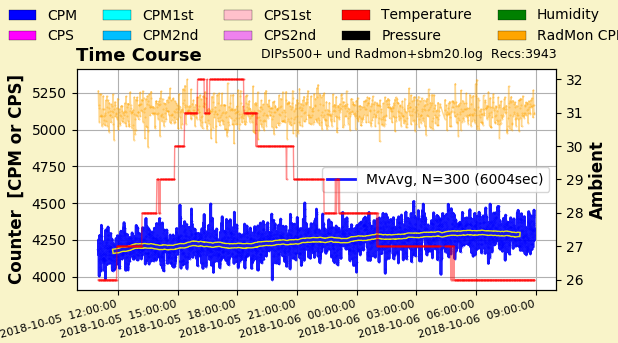 Top panel: 500+ CPM (blue, yellow framed moving average) and temperature (red line). 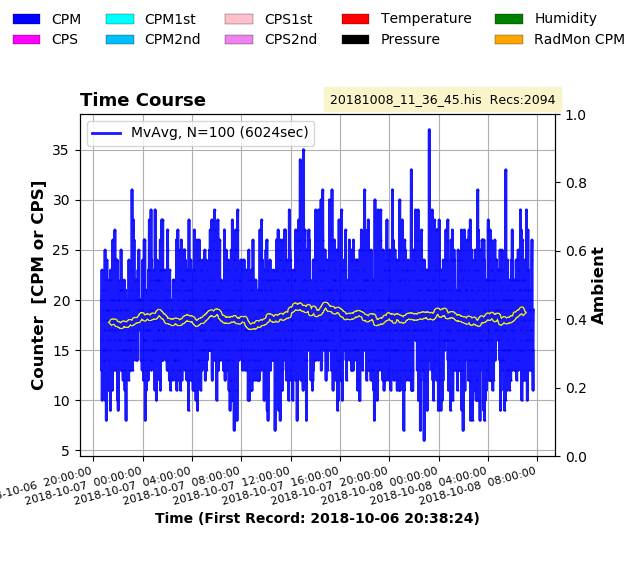 CPM again exhibits erratic behavior, which may have to do with temperature. Middle panel: RadMon+ CPM is rock solid. Bottom panel: Simultaneous run with GMC-300E+ counter positioned very close to the other two counters. Again rock solid, like in the RadMon+ case. I can't pinpoint the cause, but something is wrong with the GMC-500+ counter; you can't rely on the measurements neither at low nor at high counts! Avoid the 500 and friends, go with the 300 series, or RadMon. Ullix, it is impressive how you can find unexpected issues! You are constantly challenging GQ! I love it! Anyway, I did my own measurement during this weekend. It is only 1.5 days, but I compared both devices that I have, the 500+ V1 and V2. I will update this when I find time to download the data from the V1 (supposedly the same as yours though a different hardware version), but the V2 data is here. 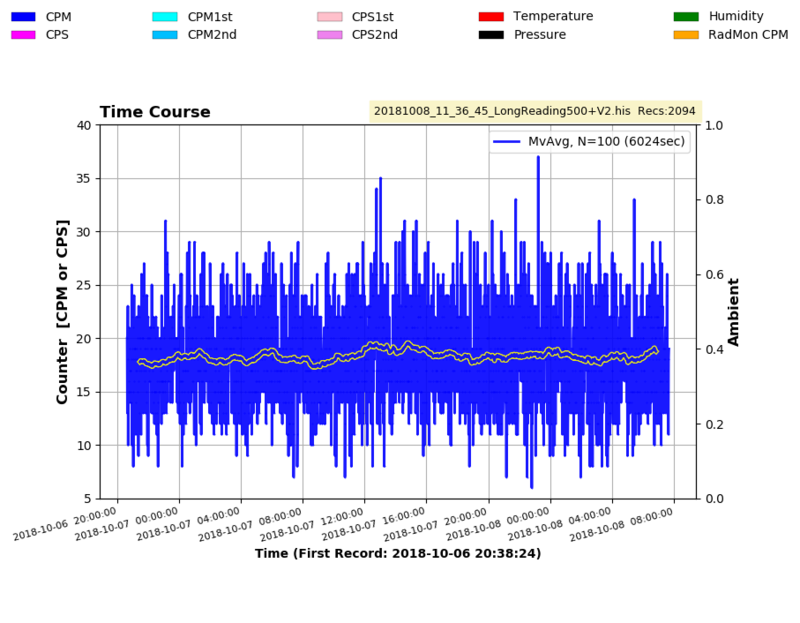 I do not have a thermometre to log the temperature in synchronism, but I can tell you that it was about 16degC during the night/early morning and about 21degC during the afternoon/evening/early night. I do not see the same effect as you, but the logging time is not very long. I can provide the actual data. 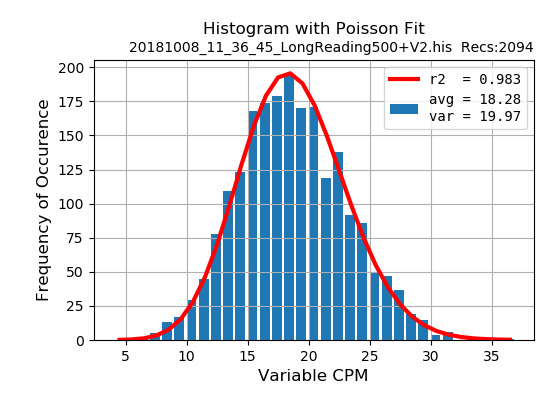 The poisson distribution looks quite good. I still need to see what happened with V1! Ok, so this is all the data from both devices in a 1.5 day run. The V2 has a slightly higher average reading as its voltage is also higher (I am using a setting 28%). But apart from that, no increasing radiation with time or weird changes with temperature. @ullix, the deviation may be related to that particular tube, not the GMC-500. I do not think user should avoid the GMC-500 based on a single unit test. Ullix could also put the "supposedly flawed" M4011 tube in the 300E+ and check again. That will rule out the tube. I remember that his 500+ unit had some problem with the RTC (not being properly connected/soldered to the PCB?). The problem might be more severe. @ZLM: I am not sure that a "bad tube" is much preferable over a "bad counter" from your perspective. If a user can't rely on a system acting properly for whatever reason, why should he buy the system anyway? But if now the M4011 tube is a problem, the user should refrain from purchasing any GMC device, or not? And nobody can tell from handling the system for a few moments whether it works properly or not. It needs GeigerLog - I don't see any other software being able to do that - and some patience. So, you are suggesting the tube may be the problem. That would be a strange coincidence that I am the single (?) person who gets a clear-glass tube in a 300E+ counter which is light sensitive, and now a blackened-glass tube which is temperature (??) sensitive. At the very least this is a challenge for your decision to use the M4011 in the first place. The black tube in the GMC-500+ continues to have the reported problems, the GMC-300E+ with the clear-glass tube is just fine. In fact, the Poisson test for the latter is as perfect as it can possibly get. (I left out pics for the RadMon+ and its SBM20; it is also clean). So, now the tubes are swapped; we'll see. 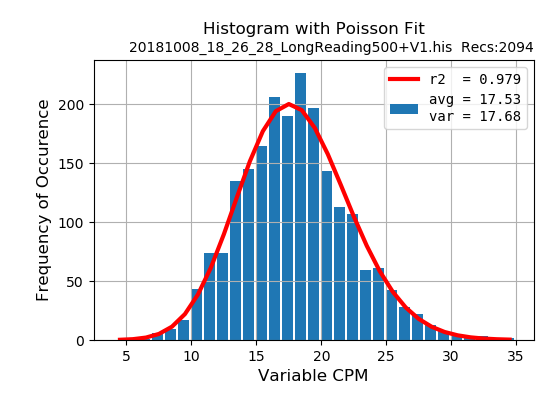 @ullix: The Poisson distribution of the 300E+ data is amazingly good! 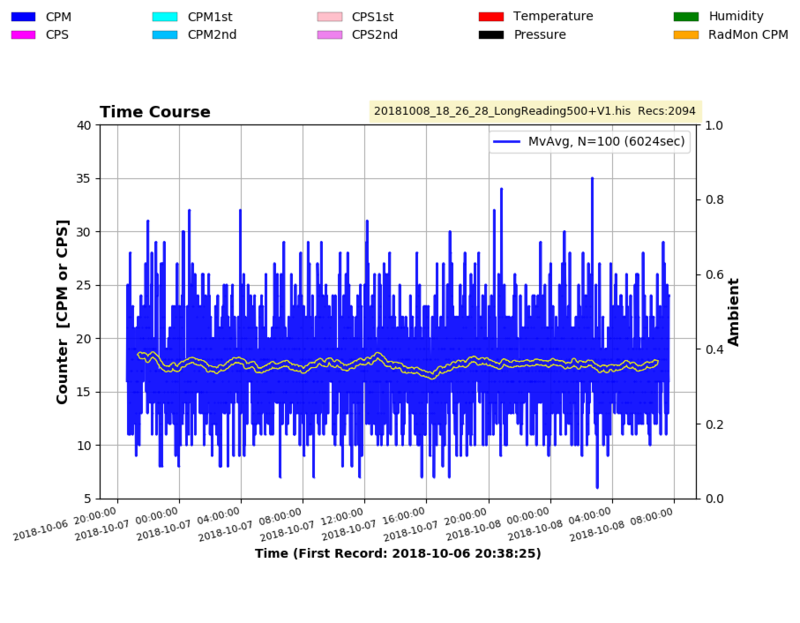 I wonder if my data was not so good because of the much shorter logging time, or due to a less severe version of the temperature problem. In any case, I think it is worth double testing all this before jumping to premature conclussions (on both sides). As I said, your 500+ device is under suspicion because it already showed other problems, so let's see what data you get from the tube swapping! On the other hand, my tests revealed that two different hardwares and different tubes still behaved quite independently against temperature changes. Therefore, the tubes do not seem to be the problem, and that points again to a problem in your specific hardware, I suppose. Ullix, this is silly. These meters are not so black and white and your comments are. Utility is utility. Your measurements are at background (~20CPM). 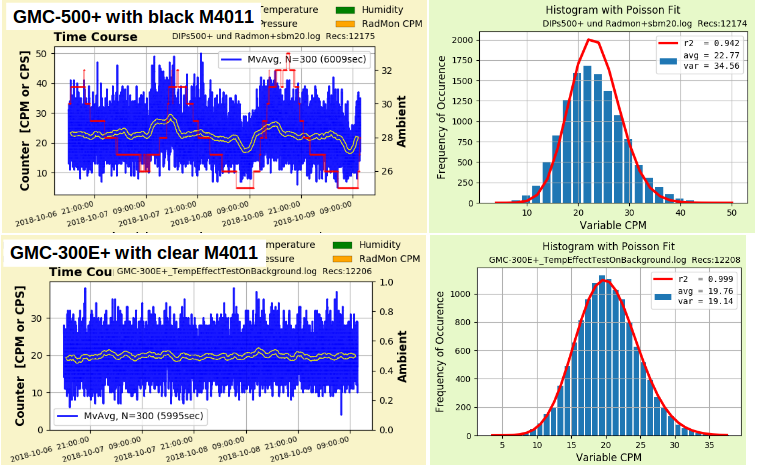 Are there variations that appear to relate to temperature? Maybe. But you are throwing out the baby with the bath water. Lets see some temperature variation with your gas mantle data. At every juncture you seem to be ready to toss the meter and then we find it's a minor annoyance or GQ applies a firmware fix ( or hardware) and we move forward. I am glad that ikerrg doesn't see the same thing. Be a little more open to understanding what is happening and possible causes before once again condemning the product as unusable. Oh well. After going through every detail I found that the GMC-500+ had a voltage setting of 700V! Probably the remnant of some testing of the power supplies of the various counters. Once that was set to ~450V, everything went back to normal. Tubes behave the same way on all counters, no detectable temperature sensitivity, all Poisson curves are fine. So, at least inadvertently we have a confirmation that there is a clear upper limit to the voltage; you can't compensate for drop in voltage with increasing count rate by raising the starting voltage to high values. Though, whatever the maximum is remains unknown. P.S. re the unusable part: this counter still cannot be used for offline-recording, as the RTC is still broken, and hence all memory time stamps are invalid. According to previous post by ZLM power supply is designed for 600VDC max. Component variation may allow for more, but 600V should be limit of expectation. Indirectly that looks an interesting finding. The voltage limit I suppose is not directly due to the tube's insulation (at least not at these "low" voltages). I wonder if the changes in the relative humidity of the air with the temperature are being more important, creating small current leaks on the small PCB devices. Alternatively (but related), it might be that the electronic resistors and capacitors on the PCB, that are not rated to 700 V (not even to 600V), could be behaving nonlinearly due to the temperature of their insulation (dielectric leaks). ... you can't compensate for drop in voltage with increasing count rate by raising the starting voltage to high values. Though, whatever the maximum is remains unknown. Well, you can compensate for the drop in voltage with increasing count rates and GQ does plan to do so automatically with firmware controlled voltage adjustment. There will be a limit of course to how far you can go with that, but I for one am quite confident that this dual GM tube meter, now with separate power supplies for each tube, under firmware control, will evolve to do that in a truly well integrated manner. With multiple meters in hand, I do see some differences in M4011 performance. If I have a direction here I'd like to see GQ go, it's to move away from these GM tube designs based on Cold War technology (and Chinese copies thereof) and to the current gold standard tubes made by LND (as they have done in the 600+). Couple that with laboratory testing and certification of performance, and I think the GQ GM meters will be unbeatable. That will also open the door to different use options. For now the GQ GM meters are in a case design that is more fitting to personal dosimeter pocket carry. When warranted, the ability to better handle the elements and field conditions, and adaptability to attach external wand/pancake detectors will be a welcome addition. With having only had these meters in hand for a little over two months, the very rapid evolution of capability and flexibility in use I continue to find amazing.